Olivia Newton John’s publicist Michael Caprio has warned of internet scams by Olivia impersonators on social media trying to scam money from fans. The Smashing Pumpkins will beam their Shiny And So Bright tour out of Seattle on Friday around the world via Twitter. Sydney’s Little Sea have teamed with Twitter to perform live for whatever device you may be viewing this in. Ringo Starr has passed the milestone 1,000,000 Twitter followers and celebrated with a special Peace & Love fruit salad. Lana Del Rey has fallen victim to an Internet hacker, who took over her Twitter page and sent out explicit and racist messages. Over the past week, a number of artists, both dead and alive, have had their Twitter accounts hacked. 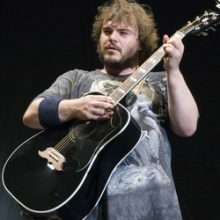 Jack Black suffered the worst celebrity death of all on the weekend … death by hacker. In what is, most likely, some sort of stunt leading up to a new release, Radiohead has completely disappeared from the internet. Singer Sam Smith is shutting down his Twitter account “for a while”, a day after he was forced to defend his Academy Awards speech. The Dead Daisies have become the first act ever to have a documentary premiere on Twitter. Taylor Swift has apologised to Nicki Minaj for causing a Twitter uproar. David Crosby’s dislike for Kanye West knows no bounds. About 46 per cent of Katy Perry’s Twitter followers are fake and 40 per cent inactive, according to Statuspeople.com. Paul McCartney will take to Twitter for the first time ever this week to chat with fans. Today, Rod Stewart will celebrate the release of “Time,” his 28th studio album and long-awaited return to songwriting, with fans during a live Twitter Q&A at 12 – 1:00 PM PST (5AM Melbourne time). Tagged as: 1970s, 2010s, rock, Rod Stewart, twitter, U.K.
Kylie Minogue has taken to Twitter following the news on the weekend that she was quitting music. No Doubt will make it to Australia although it won’t be for Soundwave next year. Flea, Ed Sheeran, Pete Wentz and scores more give their support to Frank Ocean following his “coming out” post. Apparently producers are working on a musical about the life of Cher, according to Cher. Brit-pop icons Blur will air two new songs live and streaming online via Twitter. After being harangued on twitter, Lily Allen admits that she’s back in the studio. The Grates have opened a tea room in Brisbane and former Prime Minister Kevin Rudd has tweeted that he’ll drop in. A broad range of musicians have tweeted their condolences and memories of Bee Gee Robin Gibb, who died today. The term ‘Heart Attack’ was trending on Twitter after Trey Songz uploaded his new music video today. The music community is speaking out through social media about the passing of Beastie Boys founder Adam Yauch in New York today. Aussie musician Shannon Noll has been mentioned in the Cash for Tweet controversy, unveiled this week via ABC TV show Media Watch. Madonna has tweeted a response to electro star Deadmau5’s stinging criticism of her recent onstage ecstasy reference. EMI have paired with Future Entertainment to release music and support dance artists as Future Music. Dance superstar David Guetta has played another collaboration with Sia titled ‘Falling To Pieces’ live. Scissor Sisters are back with a brand new single ‘Only The Horses’, produced by electro-pop star Calvin Harris. Superstar DJ Tiësto announces his second Club Life mix featuring remixes of Gotye, Coldplay, Afrojack and more. Popstress Ricki-Lee gets skimpy and colourful in a new clip for the streetwalking ‘Do It Like That’.